By Peter Blagojevic It has long been a belief to many that reefing in Australia would be so much easier as we have access to the largest reef in the world. Sadly, this couldn’t be further from the truth. Shipping costs, import duties and our average Australian dollar make it a little less than affordable. Unfortunately, we just don’t have the population base nor the number of reefers that other countries might have and consequently most goods are manufactured overseas. Happily with social media and the internet there is so much more available to us here “Down Under” than there ever used to be. 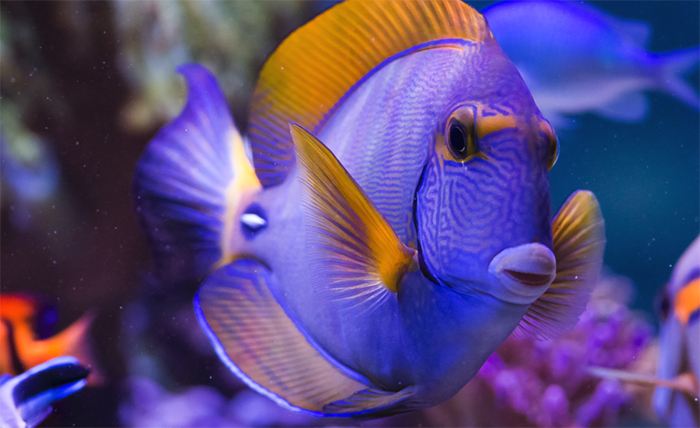 Once a hobby for the affluent, keeping a reef tank has now become affordable so the average person with a bit of disposable income can add a little slice of the ocean to their homes. Many hobbyists have, from humble beginnings moved on to have thriving business’s that supply the marine industry as either importers of products and livestock or by opening up a retail store to further promote their passion. Our greatest asset in my opinion is the ability to use NSW (Natural Sea Water) of which we have a huge abundance. We are very fortunate that our small population of 23 million is quite spread out compared to many other countries of a similar size. Polluted waterways are always a risk, but in the 15+ years of using this natural resource I have never had a problem. The water is just fantastic where it is collected and Mother Nature knows what is best for my reef system. On the other hand, there are quite a few reefers that live inland and to go and collect water is just impractical so there is still a need for ASW (Artificial Salt Water). Previously, decent equipment had been an issue with limited supplies or importers charging like wounded bulls as we are at the other end of the world. With ecommerce and an ever increasing demand for such equipment from the reefing community things have become more available & affordable. With this we have noticed a huge influx of reefers within Australia where it is almost at the point of 6 degrees of separation; where you know someone who knows someone that knows someone that has a reef tank. Australia has some of the strictest quarantine laws in the world and for now we can only import fish. Any sort of coral or invertebrate is illegal to import. Below you will find a list of marine ornamentals that are allowed to be imported in the country by licensed importers. List of Specimens taken to be Suitable for Live Import We are very lucky that we have some unique beauties that are found in our waters and as such are readily available to us. One thing I have noticed over the years that as soon as something is the “in thing” the price goes up dramatically. Acanthastrea, Scolymia, etc. used to be relatively cheap once but not so much anymore. The American market has driven the price up dramatically and established a little niche for some of these corals with elaborate names and pricing to match lol. Like anything though there are fads, they wax and wane like the cycle of the moon. The plus side has been that some spectacular specimens are now collected with a myriad of colours. Social Media and the Internet With all the pages available to us on the internet these days the ability to share information about our reef tanks; what works and what doesn’t is just amazing. Usually within 24hrs you can get a response, weigh it up and if it seems right for you that is the way you will proceed. We all have opinions, some based on scientific evidence and some on just our own experiences. Some of the crazy reefers we hang out with in the USA. I for one am not an expert, just a mere hobbyist that has turned my passion into a business and from that I have met some amazing people. Four years ago we decided to attend our first MACNA conference. I was blown away by the amount of people that attended and the wealth of information available from the professionals in this hobby. Many take the time to answer your questions and delve into what the future may hold for us reefers. 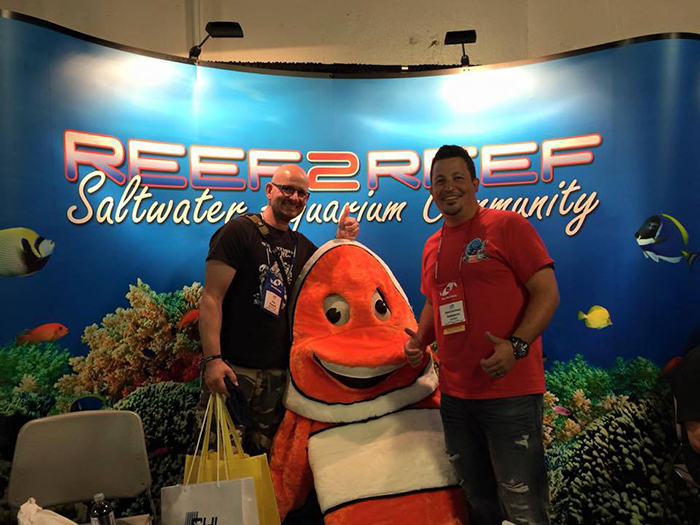 It was an amazing yet scary experience our first time attending not knowing anyone, but with a little help from my partner Sue we met and chatted with many a reefer and even some of the “Reefing Gods” who I had read about online or whose books and articles I had read. Turns out they are just ordinary people like you and me. It’s just that their passion is at a different level to ours and it shows not only in the positions they hold at various institutions, but also in their personal tanks. 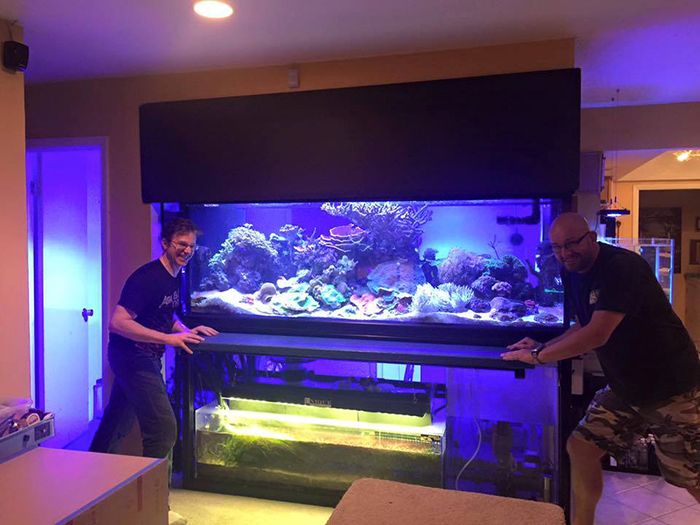 Reef keeping in the USA can be a little different from us with a majority using ASW for their setups and most have basements which make fantastic areas for tanks. Some use their basements as sump rooms while others have them setup as another part of the house with all the modern luxuries to enjoy the reef tank. We have had a great time exploring as many reef tanks as possible while over in the USA across the last three years. It’s been a privilege to see how things are done differently with some innovative ideas that have become a staple in most aquaria. I have been very lucky to see some great tanks and here is one of them. 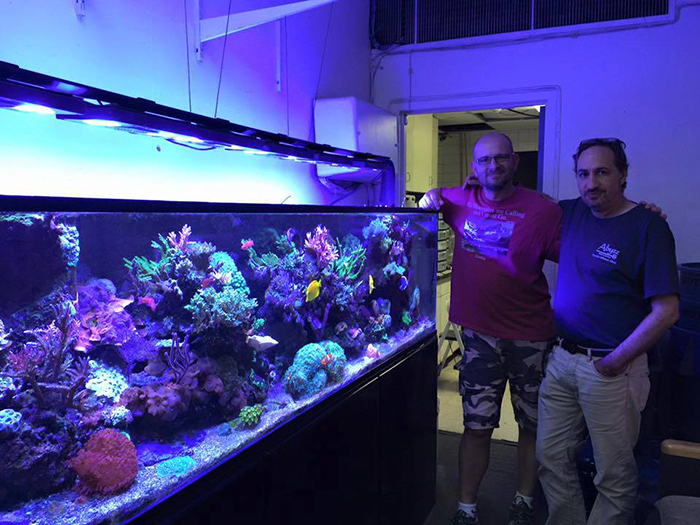 Marc Levenson’s passion for reefing is astounding and almost everyone knows Marc. Lots of nifty ideas and creations in his house and always happy to help us reefers with reviews and tips and tricks about new equipment or how to do certain things that might be a bit baffling or daunting to us. Wish I could have brought some of that scrolling red Montipora home with me! I’m trying to steal Marc Levenson’s tank from him. 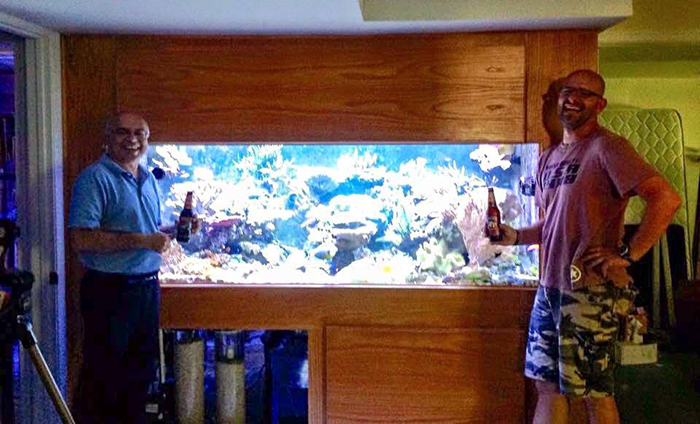 Another common thing amongst reefers is to show you their systems and the goodies that they have, usually over a nice cold beer with great company. I was fortunate enough to meet Pam and gently pat her on the head. Joe Yaiullo’s tank is something to behold, all 20,000g of it. Even Pam wanted to go for a swim in the tank to play with the fishies. 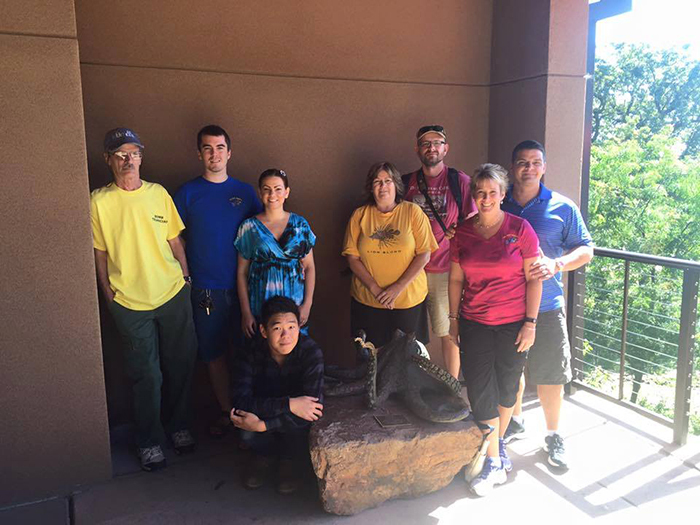 The dedication and commitment that Joe has is something to aspire to and we were privileged to be shown all around the aquarium even over the top of it. 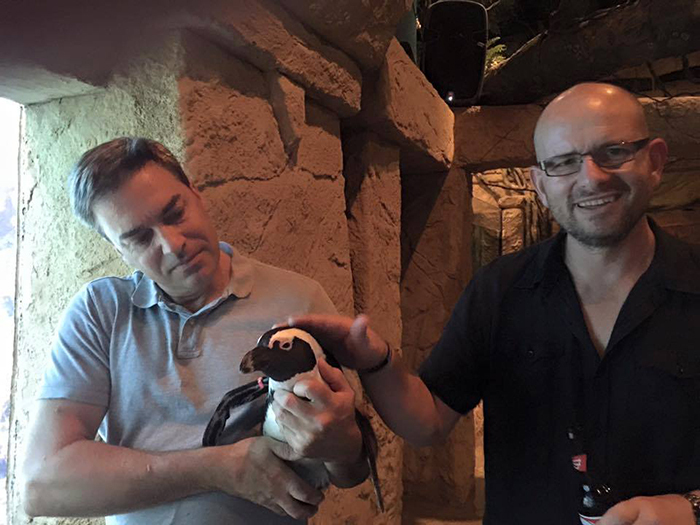 Joe Yaiullo holding Pam with me patting Pam. It is funny how you meet someone briefly for a few minutes when you’re introduced by someone else and then you get an invite to peruse their tank. Seems to be the just what happens with reefers. Far from it being a nerdy cellar dweller activity where you must be weird because you like fish, these days reef tanks are often the focal point in many homes or institutions. They’re a chance to talk to fellow reefers where you can have a laugh or cry over what might be happening in your reef tank. I was very lucky to be invited by Randy to visit his tank in Brooklyn at the Pratt Institute. This is his baby and what a baby it is. The simplicity of the system and the growth of the corals is phenomenal. Everything just works in this tank and as you enter the hall where Randy teaches you can see his masterpiece through the glass. Very distracting or maybe just distracting to me as I know I wouldn’t get any studies done. I would be watching the tank all the time. Randy Donowitz showing me his pride and joy. Sometimes in this hobby of ours there is so much information to process that it can get confusing which way to go or who to listen to. Luckily there are some fantastic forums and social media pages that are available to us. One of these is Reef2Reef and I had the pleasure of meeting David the owner of Reef2Reef. It is a wonderful forum and very friendly with lots of advice to help out the beginner to expert. Their popcorn at MACNA is always a great way to refuel too! Me, Nemo and David Hammontree. Everyone knows Sanjay! We got invited to his house to have a look at his tank and man the corals in his tank are spectacular. Even with all the issues he has had with colonies being happy one day and then not the next it is an amazing tank. 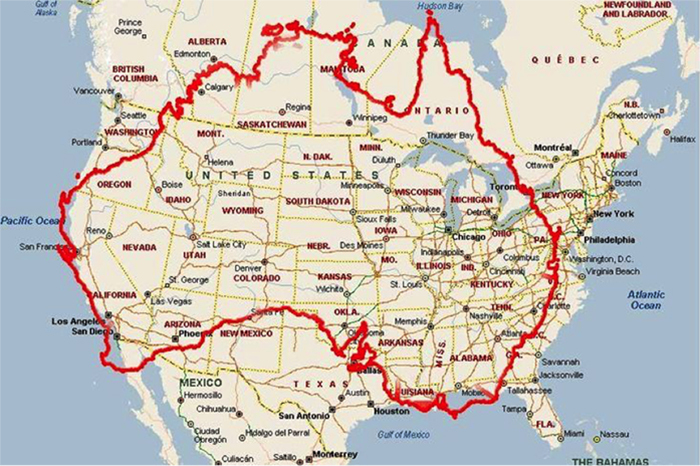 The size of the colonies and how they interacted with others was quite surprising. Sanjay always has a smile on his face and loves reefing. There were quite a few reef tanks at his home and then there’s the one at Penn State where he works which he looks after. Can’t wait to see them again this year and see what has changed with each one. Sanjay Joshi and me enjoying a nice cold drink and talking tanks. What’s it all about? Well to sum up my ramblings I would say that reefing worldwide is pretty much the same except a few little idiosyncrasies that are unique to each country. We all have our ways of reef keeping that differ from country to country whether we use NSW or have basements to house our tanks and equipment. The one thing that is common ground is the passion to have a healthy and happy reef system. It doesn’t matter if you have been in the hobby one year or fifty, the passion shows in the majority of people I have met from all walks of life. Outsiders look at us weird for being fish nerds and I don’t think that will change ever, but I just smile and think they are missing out on something special. Happy reefing everyone! Enjoy your reef no matter what size it is or what issues might prevail. There is always a fellow reefer out there that will lend a hand if needed.